The Epson 1275 is great for printing at home and office, offering high quality prints thanks to cutting edge technology. In the end your Epson 1275 will polish off its printer ink, and when it finally happens you'll soon note that ordering Epson 1275 ink is typically quite expensive. But you have no reason to be concerned about shelling out the high fees you'll uncover on the high street because now at Cartridge Save you can pick up all the Epson 1275 cartridges you'll need at ultra competitive prices. Save cash on your ink by buying online at Cartridge Save! You don't have to pay more for your 1275 original cartridge or 1275 compatible ink in the main street when it is much easier to save money buying online with Cartridge Save. Get complete peace of mind by ordering your Stylus Photo 1275 ink cartridges from us seeing as each one is protected by a quibble-free money back guarantee. Bear in mind that every purchase also comes with free delivery, mostly delivered to you on the next working day! Designed for photo printing needs, the Epson Stylus Photo 1275 gets the job done for a considerably low price. This budget-friendly printer delivers good quality photos and it can print as large as 13 x 44 inch panoramas. The Epson Stylus Photo 1275 inkjet printer uses Micro Piezo ink jet technology and Epson Photo Ink for water resistant and light fast prints. The Stylus Photo 1275 is reliable, but it has already been surpassed by other photo printer models. The Epson Stylus 1275 photo printer has a simple rectangular shape with extendable output and vertical input tray. Control buttons are located on the side, along with indicator lights for low ink. The Epson 1275 photo inkjet printer can print on a wide range of media types, from photo paper to banner paper, glossy photo film and self-adhesive sheets. The input tray can handle 100 sheets while the output tray can handle 30 sheets. For connectivity, a USB and parallel port are available. The Stylus Photo 1275 photo printer is inexpensive and offers good value for money. The Epson Stylus Photo 1275 is also pretty cheap to run thanks to its low cost consumables. 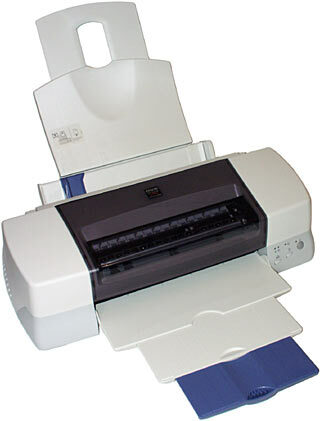 The 1275 Epson Stylus Photo is even easy to setup and operate. The Epson Stylus Photo 1275 inkjet printer is designed to support both Macintosh and Windows operating systems. The Epson Stylus Photo 1275 colour printer is already outdated especially when compared to newer photo printers that have memory card slots, PictBridge sockets, and LCD displays. This device also lacks networking capabilities.